Some college teams have adapted it, including the Tennessee Lady Vols and UConn's Lady Huskies. This article linked below discusses the triangle offense in some depth with numerous diagrams pointing out many of the options. Many of the diagrams point out how the offensive player(s) read and react to the defense. The offense is detailed and takes a while to learn, but is very effective once players learn how to read and react to the defense. The offense can be confusing for the defense as it can be initiated in many different ways... not the same way with every possession, as the triangle can be established in a variety of ways. Spacing is key, with players about 15-18 feet apart. 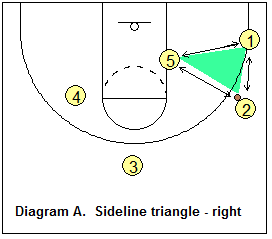 The basic structure of the offense is the "sideline triangle" on one side of the floor, and a "two-man game" on the weakside (see diagram). The sideline triangle is formed by a post player on the block and two perimeter players, one in the corner and one on the wing, and can be set up on either side of the court. There are many passing, cutting, and dribble-attack options, in addition to low post play options. The wing and low post player can also play the "strongside 2-man options". The "two-man" weakside offense consists of a guard at the top, and a player at the weakside elbow-extended area. There are also many "pinch-post" 2-man options. Players can interchange within the offense, but it's usually best to have two post and three perimeter players. The spacing stretches the defense to defend both sides of the court, and this creates a problem for the helpside defense and defensive trapping. Unlike a free-lance motion offense, players should be looking to fill the five spots. But like a motion offense, players read and react to the defense without having to call set plays.